Lesson #1: Not only do you get more leg room in Economy Plus on United, on our flight you got a 5-hour concert of The Weather Song and Mary Had a Little Lamb. Worth every penny, if you ask me. Lesson #2: Having never been to Kauai myself, I was immediately impressed by the beauty as we got set up poolside. The clear water, crashing on the white sand. The palm trees waving in the breeze. And the 7-year-old boy spitting blood into the lovely tropical bushes thanks to the ever-widening gap in his top row of teeth. Lesson #3: Our tooth fairy, Pearly, is either a tough cookie or a smart one. We’re not sure whether she flew all that way or called up a friend for a favor. Either way, Big earned himself a bit of souvenir money on day one. Lesson #4: If you have to wake up every two hours in the middle of the night as your kids adjust to a new environment, it’s much more pleasant to do so with the sound of waves crashing outside your door. Lesson #6: Even 4-year olds need vacation time to find themselves. Little decided he’d really like a new nickname, and from now on, we should call him “Shark”. Lesson #9: While we did an embarrassingly poor job of focusing on Big’s school work each day, that doesn’t mean the kids weren’t learning. We worked on math: discussing what the two-hour time difference meant they would have been doing at home — all day, every day; adding up all the geckos sightings; and creating patterns of how we threw the ball in the pool. We also got in some science lessons: that’s rice in all the salt shakers which helps in the humidity; green geckos are actually from Madagascar, and the brown ones are Hawaiian — both are cold blooded, so you find them near lights; and when you feed the fish in the pond bread, the birds who fly down to eat the fish you’re feeding appreciate your hard work in fattening them up. What better way to learn about the food chain? 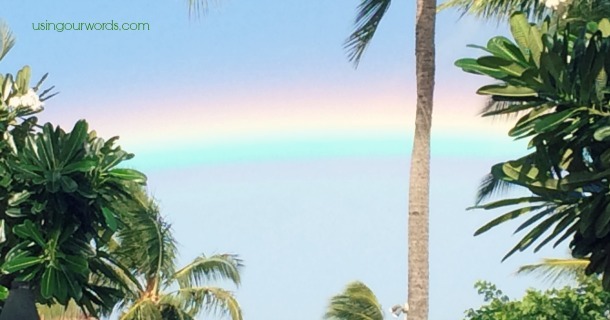 Lesson #10: As Little pointed out, in Hawaii, there’s another option for the forecast — rainbow-y. Lesson #11: Everyone should be able to walk out their patio door, hop on a water slide, and get to where they’re going for the day. Just ask Big. Lesson #12: Lenny would like the Olympic Committee to consider adding water sliding to the 2016 Summer Games — which he, of course, would qualify for. I’m all for it, but should they include a women’s team, I highly recommend that strapless bathing suits not be in consideration for the uniform. Lesson #14: In a way, this was really a service trip for our family. We gave all the honeymooners and babymooners all kinds of reasons to roll their eyes and talk about how they will absolutely never [fill in the blank]. No doubt they’ll pay it forward in a few years. Lesson #15: Even when the forecast there calls for rain, you might want to dress in a bathing suit. Because a November downpour can make you feel like you just took a dip in the pool. Lesson #16: When you get to your last day of vacation with just four diapers left, you’re truly playing with fire. Lesson #17: They really need a suggestion box on airplanes. I mean, would it really be so hard to put lids on kids’ apple juices that they recklessly fill to the brim as you’re bouncing through the sky? Short and wide just isn’t enough, I’m afraid. Lesson #18: When you have a kid who’s prone to motion sickness, waiting for the turbulent flight home to do homework isn’t such a great idea. Lesson #19: When traveling with kids, they do adjust to the time difference eventually. You just have to hope it isn’t the day you get home and they’re supposed to go back to school. Lesson #20: Nothing alleviates your parental guilt for taking the kids out of school for a week like coming home to a notice that, if your kid had been there, she would have been exposed to lice. Instead she got a golden tan. The main thing I learned though, is that my family is pretty awesome. Sure, we might need some work on sleeping past 4:30am, using manners in restaurants, and being grateful for special getaways, but who doesn’t? (Besides the people mentioned in Lesson 14, of course.) My husband is hilarious. And generous. And one mean water sliding machine. Big is suddenly so mature, independent, and helpful. Little, while hard to crack, is creative, silly, and cuddly. And Pink? Well, she’s just a bundle of sunshine. And even in a place that was filled with it, she was brightening faces everywhere she went. Including mine. Yes, this family needed a vacation. And, if you ask me, it was just right. Even when things went a little bit wrong.